Rain all day long!!! I have to update the site a bit, upload some new photos and start working again in the English activities section. There is a plan to include Halloween and Christmas activities or pastimes and also finish and upload a new section which is a series of grammar class notes. There is a lot of work to do though!!! 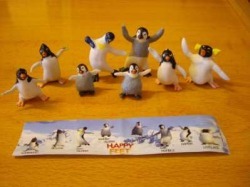 And good news: After a year or so I've finished my happy feet penguins collection. You can see it here.